The 4th BC Card Cup is about to enter the round of 16. This year’s tournament has been full of upsets with favorites falling left and right in the early rounds. Two stand-out players so far have been 16 year old Mi Yuting 3P and 18 year old Dang Yifei 4P of China. 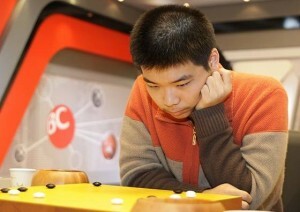 In the first round, Mi defeated Korea’s young star, Park Junghwan 9P. Then in the round of 32, Mi caused quite a stir by defeating the legendary Lee Changho 9P. Dang followed suit by defeating Lee Sedol 9P in the round of 32. Mi and Dang are joined by China’s Gu Li 9P, Niu Yutian 7P, Zhou Ruiyang 5P, Kong Jie 9P, Liu Xing 7P, Xie He 7P, Tan Xiao 5P, Chen Yaoye 9P, Jiang Weijie 9P, Piao Wenyao 9P and Hu Yaoyu 8P, and Korea’s Lee Wonyoung 3P, Park Younghun 9P and Baek Hongseok 9P. Unfortunately for Japan and Taiwan, the handful of their players who made it to the round of 64 were eliminated at that stage. - Jingning; based on her original article: China on a roll in 4th BC Card Cup at Go Game Guru. Photo: Mi Yuting 3P.